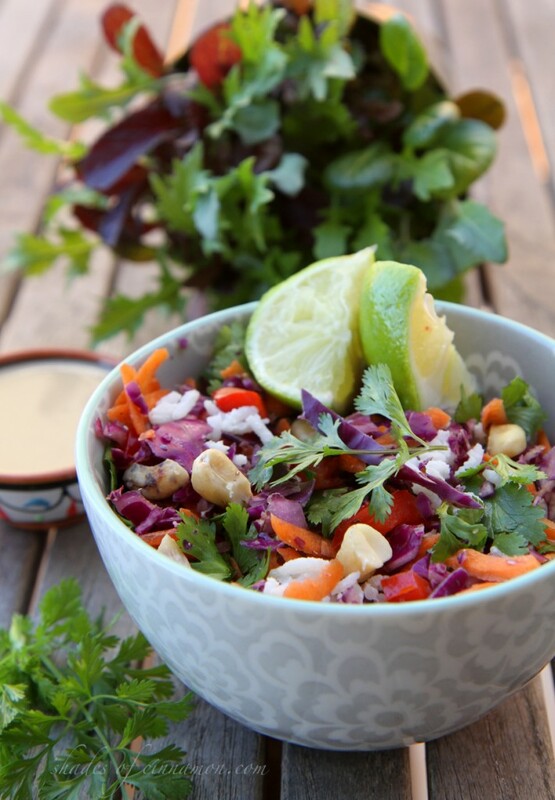 When I travel to California, I am guaranteed to find a new favourite dish, and this insanely delicious Thai salad with coconut rice and satay dressing is just that recipe. It’s great for lunchtime or as a light summer evening meal. 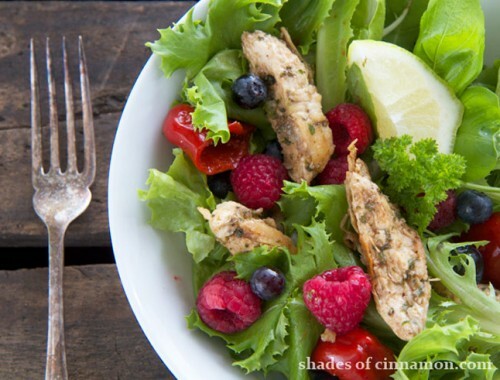 If you feel vegetables are not enough for you, add sliced grilled chicken, or serve as a side salad at a barbeque. We made this with herbs and vegetables harvested straight from the garden, making this meal even healthier. 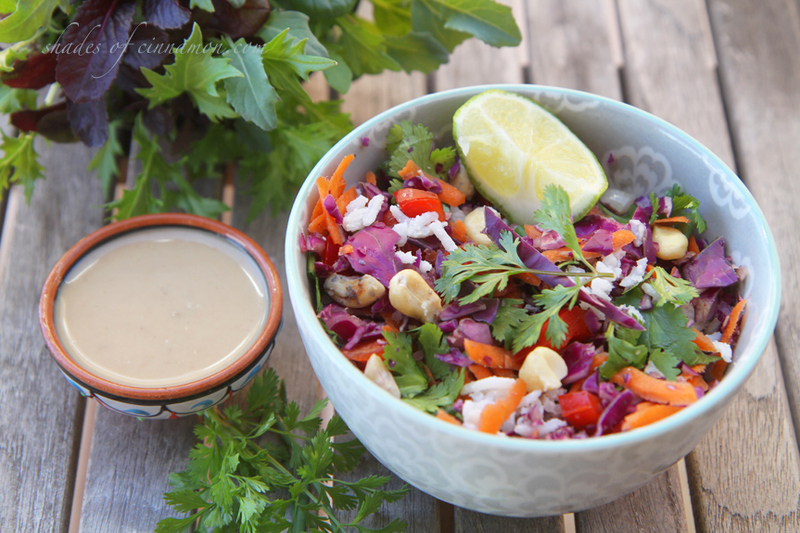 Looking at the beautiful vibrant colours that make up this salad, you just know it is going to be overflowing with goodness. 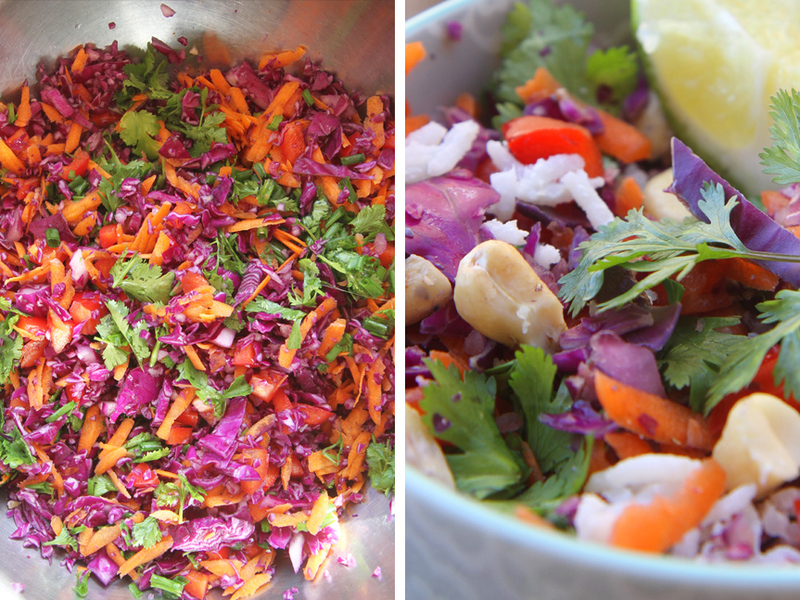 Chop and grate red and green cabbage, red onion, carrots, red bell peppers, cilantro and spring onions and place them in a large bowl. The Jasmine rice is cooked in one cup of water, and a tin of coconut milk, which makes it so delicious. Add a dash of salt to taste and allow the rice to cool to room temperature. Mix all the ingredients for the satay salad dressing in a small pot and heat it until the peanut butter has softened and everything has combined. 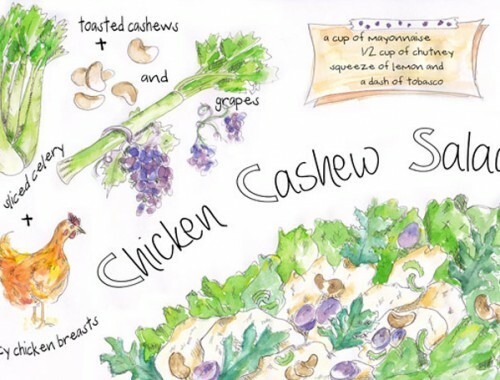 Toast the peanuts and the cashews to allow the beautiful nutty flavours to be released. Mix the rice into the salad and toss in the crunchy nuts and dressing just before serving. Trust me, this salad is a keeper. Chop and grate all the vegetables and place in a large bowl. Cook the Jasmine rice in one cup of water, and the tin of coconut milk. Mix all the ingredients for the satay salad dressing in a small pot and heat until the peanut butter has softened. 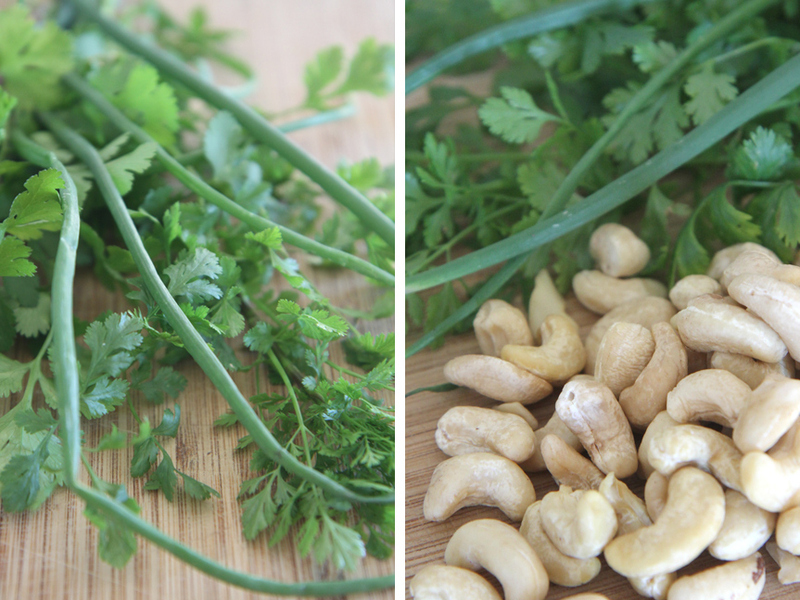 Toast the peanuts (if raw) and the cashews to allow the flavours to be released. The salad can be served mixed with the rice and satay sauce or serve separately so that you can choose how much rice you want. Only add the sauce and nuts just before serving so that the nuts remain crunchy. No Steven, serve the whole salad at room temperature including the rice. So glad you made it Marie, don’t you just love the coconut rice. I think it would go great with a lot of different dishes. 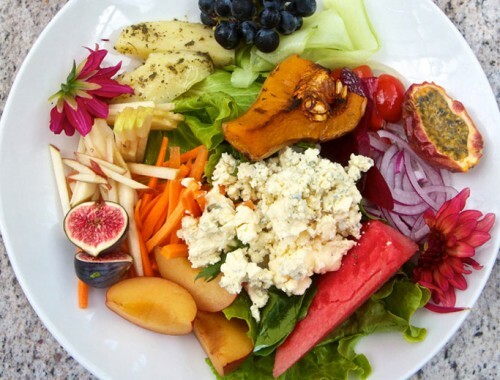 California seems to be endless days of beautiful sunny weather even when everyone else is experiencing the cold, so this salad has been a perfect meal which is great the next day too. Really helps when there is food on the ready with a sick toddler and newborn in the house. I love satay sauce. The fact that you have all these colourful veggies to go with it, it sure is a keeper. I’m tempted to throw in some boiled lentils too. Yum..